The Smithsonian National Museum of African American History and Culture in Washington, Ghana’s National Cathedral in Accra and the Holocaust Memorial and Learning Centre in London, UK are only a few of the projects by Anglo-Ghanaian architect Sir David Adjaye chosen by The Design Museum for an exhibition focusing on the role of monuments and memorials in the twenty-first century. Monuments have a profound significance for the social and collective memory of a community, celebrating its triumphs and commemorating its failures, and the community sees itself reflected in them, even though their form and the way society experiences them change with time. There are countless examples of this, always open to discussion; the London Design Museum draws the world’s attention to the work of Sir David Adjaye in the newly opened “Making Memory” exhibition. The museum selected seven projects by the Anglo-Ghanaian architect as examples to investigate the role of monuments and memorials and therefore the role of architecture as a tool for representing memory in the twenty-first century. The exhibition begins with an overview of monuments and memorials all over the world, beginning with the Acropolis in Athens, built in 447 B.C., and ending with Gillian Wearing’s statue of Millicent Fawcett in London in 2018, continuing with a selection of seven projects by the Anglo-Ghanaian architect. The selected monuments are the Smithsonian National Museum of African American History and Culture in Washington D.C., Ghana’s new National Cathedral in Accra, the UK Holocaust Memorial and Learning Centre and the Sclera Pavilion for the 2008 London Design Festival, Gwangju River Reading Room in South Korea, the MEMO Mass Extinction Memorial Observatory in Portland, and Coretta Scott King and Martin Luther King Jr. Memorial in Boston. 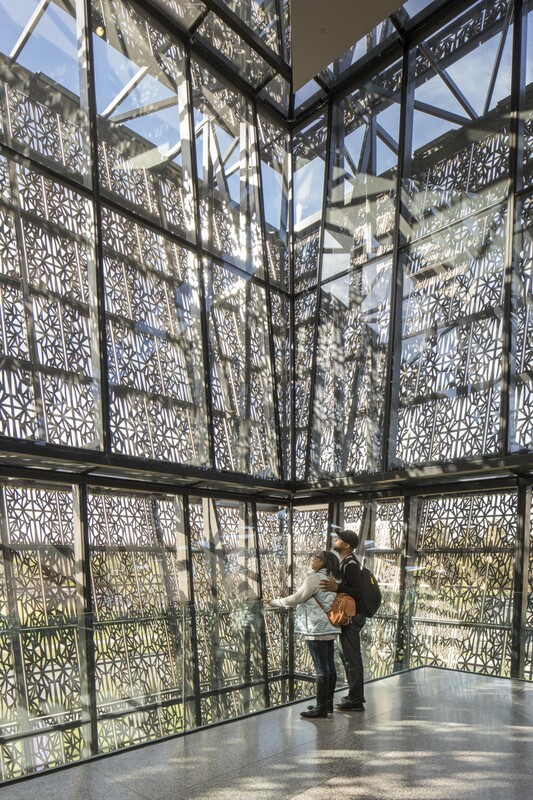 Sir David Adjaye’s works demonstrate that today’s monuments are not just static objects of contemplation but complex, dynamic spaces with a multitude of different functions. Each project is presented in its own room, with an installation specifically designed to recall a number of features of the project. The exhibition is a clear demonstration of the architect’s way of working, drawing inspiration from anthropological, historic and social elements. Thus, for example, the presence of a Yoruba artefact is linked with the design of the metal panels on the façade of the Smithsonian National Museum of African American History and Culture in Washington D.C., inspired by formal elements of the art of the Yoruba, a linguistic and ethnic group in Western Africa heavily impacted by the slave trade. The exhibition features the first public exhibition of three projects remaining to be built: Coretta Scott King and Martin Luther King Jr. Memorial in Boston, the MEMO Mass Extinction Memorial Observatory on the Isle of Portland in Dorset county, and the UK Holocaust Memorial and Learning Centre in London. The UK Holocaust Memorial and Learning Centre will be the first building about the Holocaust in the UK, designed by a team led by Adjaye Associates in partnership with Ron Arad Architects for the memorial and Gustafson Porter + Bowman for the landscape design.